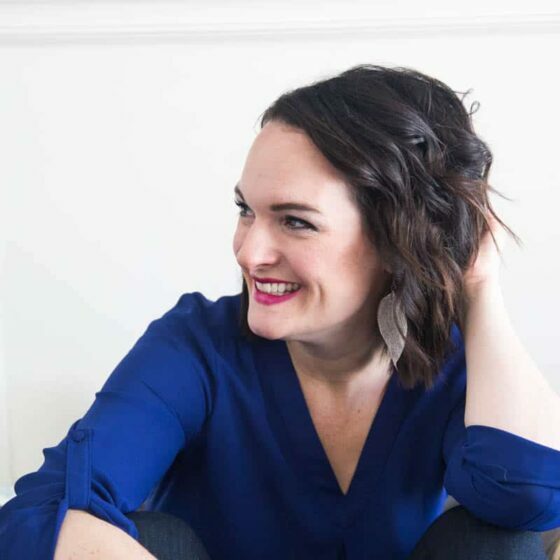 I have a confession: I’ve been leery of fat bombs for a long time. Don’t know what fat bombs are? They’re little treats that are mostly made of healthy fats, like coconut oil, and are super popular in the low carb – high fat camp. I had a hard time with it. And I may have accidentally swallowed some of it on one occasion. *gag* Eating straight coconut oil isn’t my cup of tea, and I wondered if fat bombs would be a similar experience for me. Nope. Not even close. Eating a fat bomb is closer to eating candy than oil pulling, I’m happy to announce. 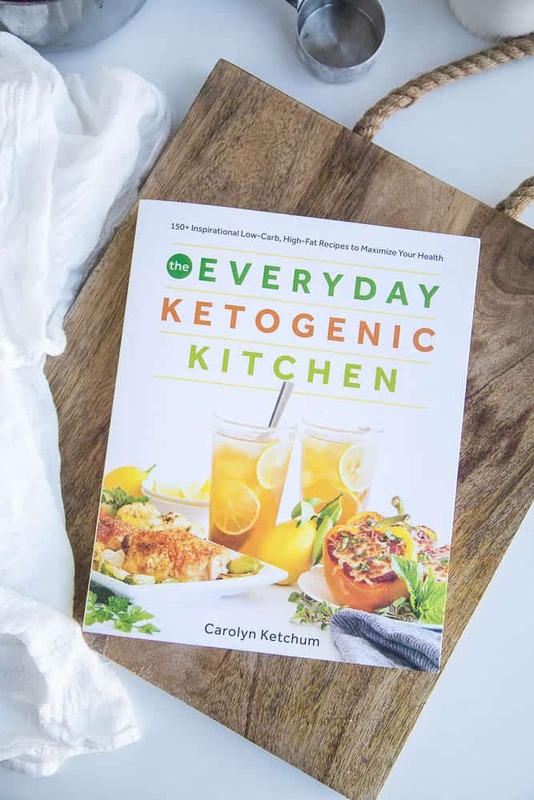 This recipe came from The Everyday Ketogenic Kitchen by Carolyn Ketchum who blogs all kinds of low-carb goodness over at All Day I Dream About Food. 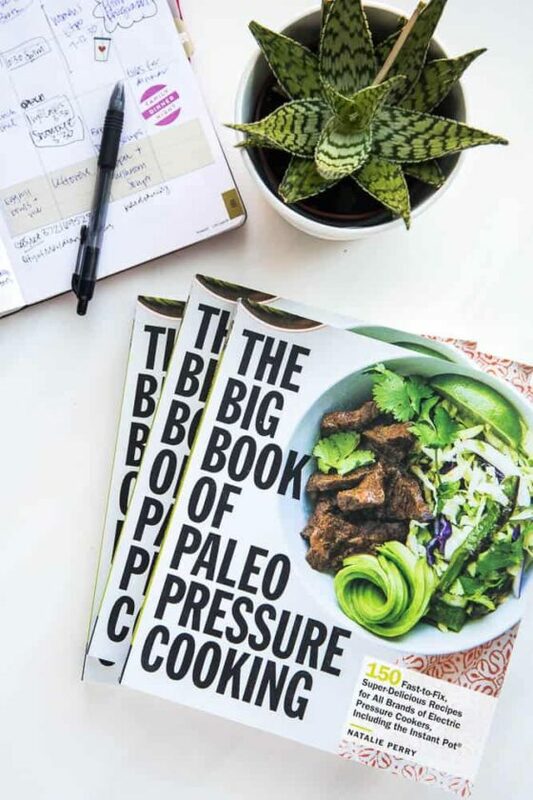 If you’re wanting to explore a ketogenic (keto) diet, this book is a must-have. I’ve been tinkering with keto the past few weeks, and I have some thoughts on it that I’ll share later. Meanwhile…. This recipe is easy and simple — only 4 ingredients. But… they might not be ingredients you have on hand all the time. Coconut oil – You probably have this? I get the big tub at Costco. 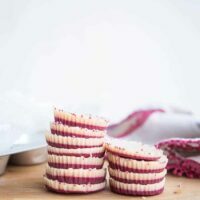 Freeze-dried raspberries – I LOVE freeze-dried berries and get them at Target or Trader Joe’s. I don’t eat them straight, but I use them in recipes. 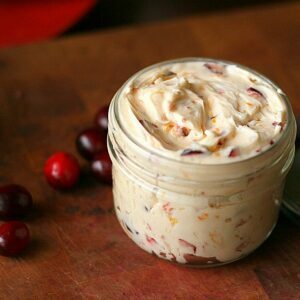 Like, Strawberry Cream Nut Butter. Or Strawberry Cream Larabars. (I like the strawberries, can you tell?) I also pulverize them and mix them with buttercream when I make macarons — out of this world delicious. But we’re talking about low-carb stuff, so forget I mentioned macarons. Or buttercream. Cacao Butter – This was a new one for me. I’ve seen it used here and there and was curious about trying it. It’s an incredibly nutritious superfood — basically pure oil cold-pressed from cacao beans. It IS pricey, but you don’t use much in this recipe. 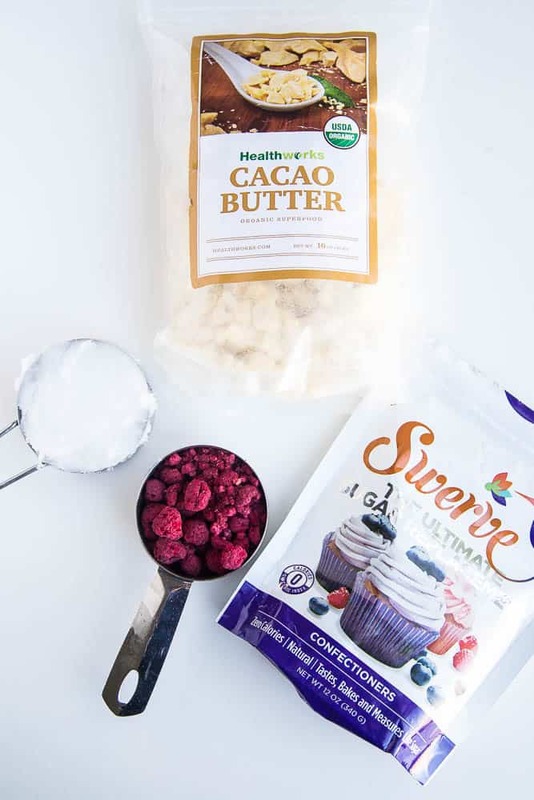 I got some cacao butter on Amazon, but I think you can find it at healthy grocery stores or hippie supplement shops. OR you can probably substitute more coconut oil instead. The fat bombs might not stay hard for long at room temperature or be as portable if you do that, though. 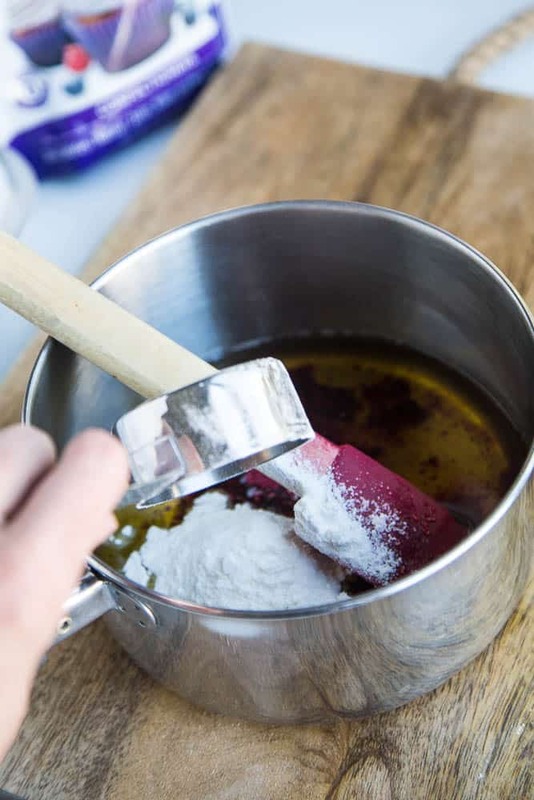 Sweetener – I admit, I was most curious about using erythritol and/or xylitol in sweets, so of course I headed to the dessert section of Carolyn’s book. She recommended Swerve, so I ordered a package of confectioners Swerve on Amazon. (Can we have a moment of gratitude for Amazon? Amen.) I have mixed feelings about erythritol, but I felt like it was ok in this recipe. I’m just going to walk you through this real quickly. First, melt the cacao butter and coconut oil together. Then, pulverize the freeze-dried berries. 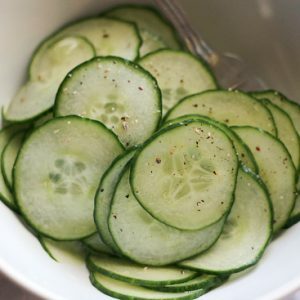 You can use a food processor or a blender. I like to use a coffee grinder that I grind spices with, too. I don’t actually use it for coffee. If you grind coffee beans, it’s recommended that you have a separate grinder for spices or your coffee will have some interesting added flavors. Add the pulverized berries and sweetener to the pot and stir it around until the sweetener has mostly dissolved. Divide it into silicone or paper-lined muffin tins. I made 12 fat bombs because I can’t read directions. And I like it when my muffin tin doesn’t have any vacancies. After an hour or so in the fridge they’ll look like this. The raspberry powder will sink to the bottom creating a layered effect. Pretty, right? 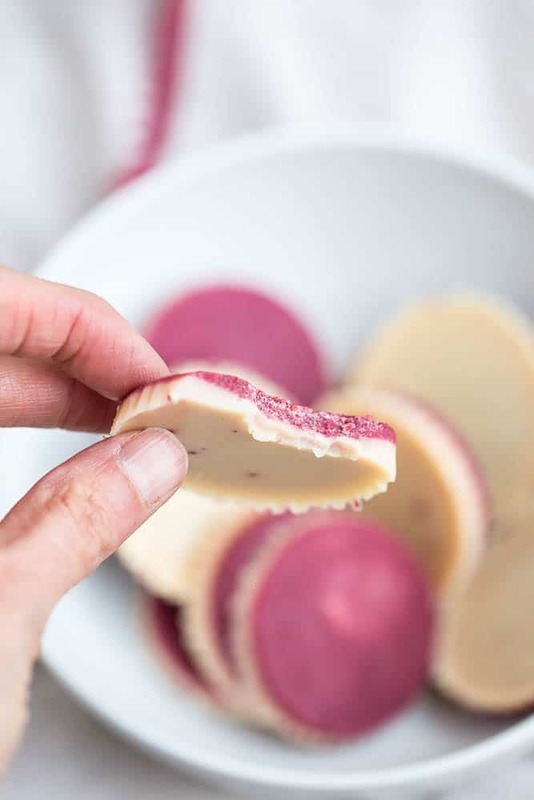 You can store these fat bombs in the fridge and, if you’re feeling generous, let your kids have one. Mine went bonkers for these. My 2-year-old asked for them ALL DAY LONG. And I didn’t mind giving him a few because I knew he was getting some good, healthy fats. I can tell you I’m excited to have these when the kids come home with their trick or treat candy in a couple of weeks. Reese’s are my biggest weakness, and I think these fat bombs might keep my face out of their trick or treat buckets. At least for a couple of days. 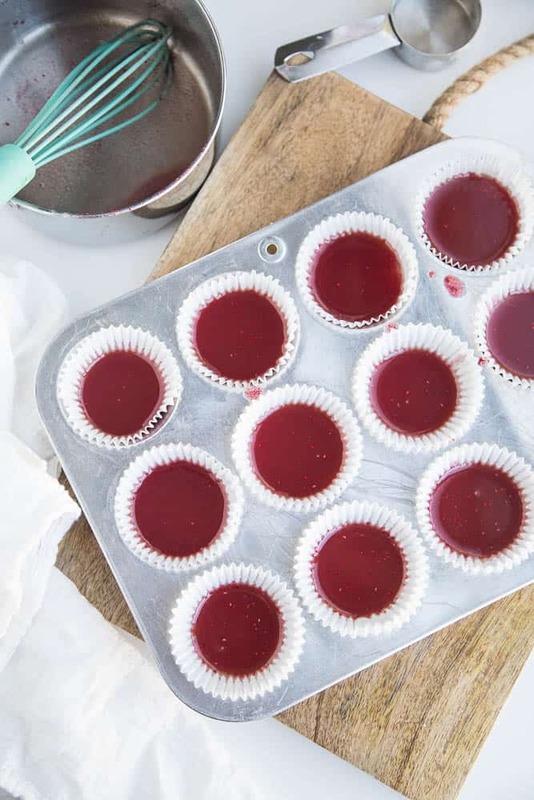 Freeze-dried raspberries give these fat bombs such a burst of berry flavor and sweetness! You'll love this creamy truffle-like combination. Line a 12-cup muffin pan with paper liners. Or use a silicone muffin pan. 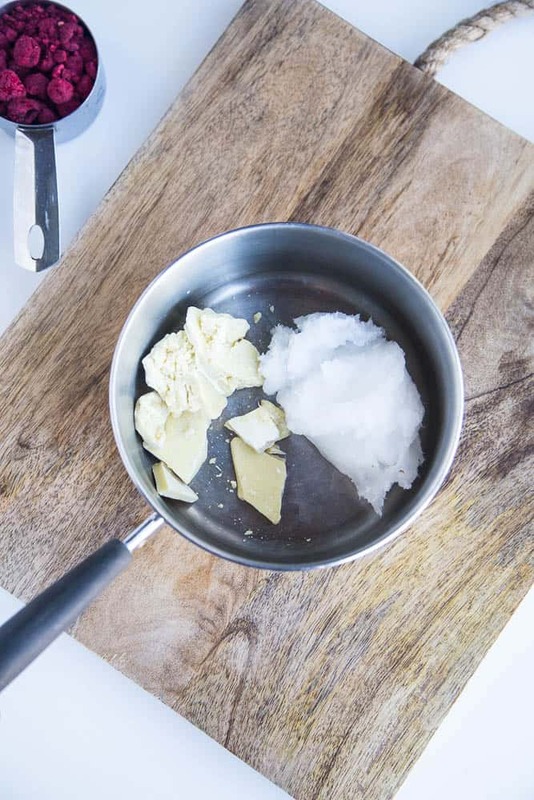 Heat the coconut oil and cacao butter in a small saucepan over low heat until completely melted. Remove the pan from the heat. 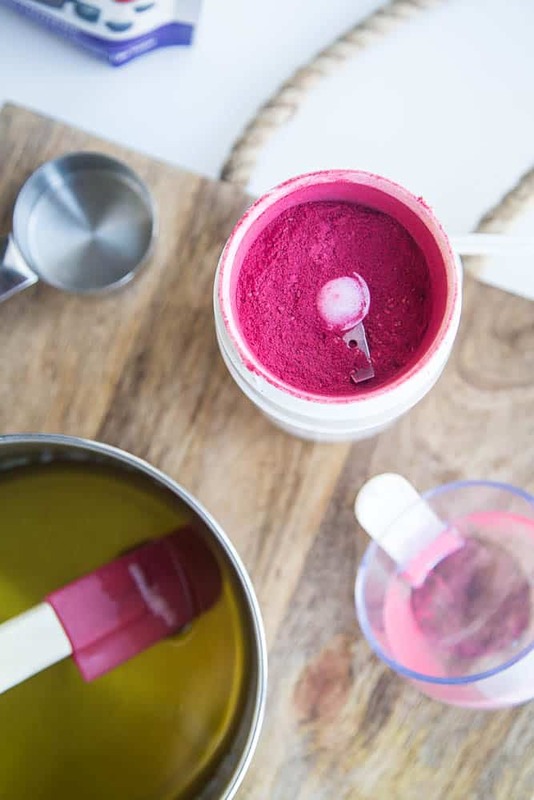 Grind the freeze-dried raspberries in a food processor, blender, or a coffee grinder. Add the pulverized berries and sweetener to the saucepan. Stir until the sweetener is mostly dissolved. Divide the mixture among the muffin cups. The raspberry powder will sink to the bottom -- no worries. 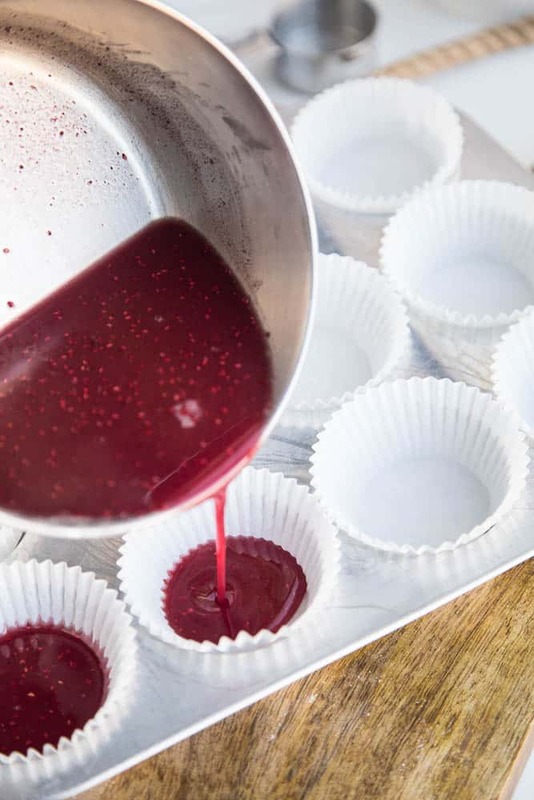 Just keep the mixture stirred as you pour them into each mold so each one has some of the raspberry powder. Disclosure: This post contains Amazon affiliate links. Purchases made by using these links provides Perry’s Plate a few pennies and helps keep this content free. Thanks so much for this review, Natalie. I am posting on my Facebook page today! You’re welcome, Carolyn! It’s such fantastic book — congrats! Carolyn, I made the White Chocolate Raspberry Fat Bomb’s for the first time today. They’re simple to make and ever so delicious! Thank you for this wonderful recipe! Glad you liked it, Larry! Can you make these with less swerve? Sweet is not a flavor I enjoy much. What is the net carb on one piece of these? Hi Judith! Net carbs is less than a gram — about .8g per serving. Can I make this with frozen raspberries? I haven’t tried it with frozen raspberries, but I imagine it would add too much moisture to the mixture. I have made it with frozen rasps but I simmered and reduced them first to remove the moisture. Good to know! Thanks Rebecca! Can I substitute butter for the Cacao butter? If you did you’d probably need to store them in the fridge and not let them sit out. Honestly, I haven’t tried butter. I think coconut oil would be a better replacement, but it would still not hold up at room temperature as well as cacao butter. How many total carbs each? And did you use a regular sized muffin tin or the minnies? I made theses with truvia sweeter, I do not recommend this, even though it is like powder, it did not dissolve. even after cooking on the stove a little longer. The raspberry mixture was more gel-like and hard to get proper amounts in each cup due to the texture. Oh well, I will try again ????. 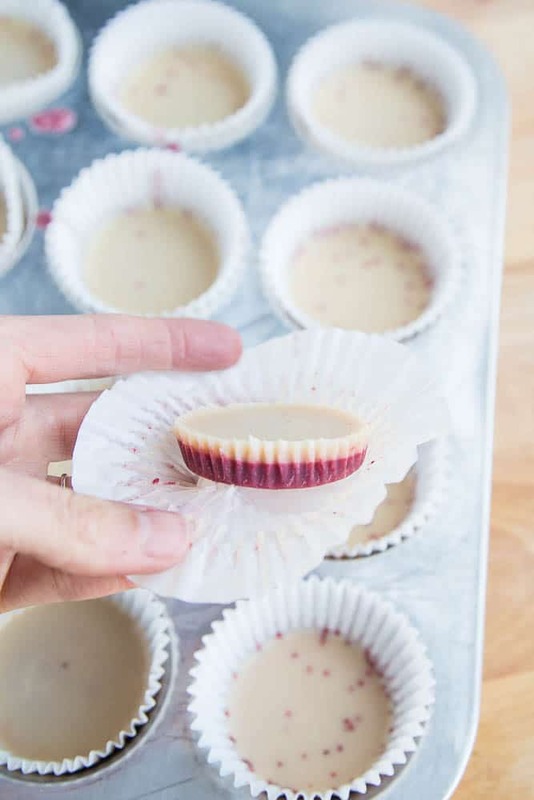 Pingback: Easy Keto Desserts: 50 Keto Sweets and Treats for Weight Loss! 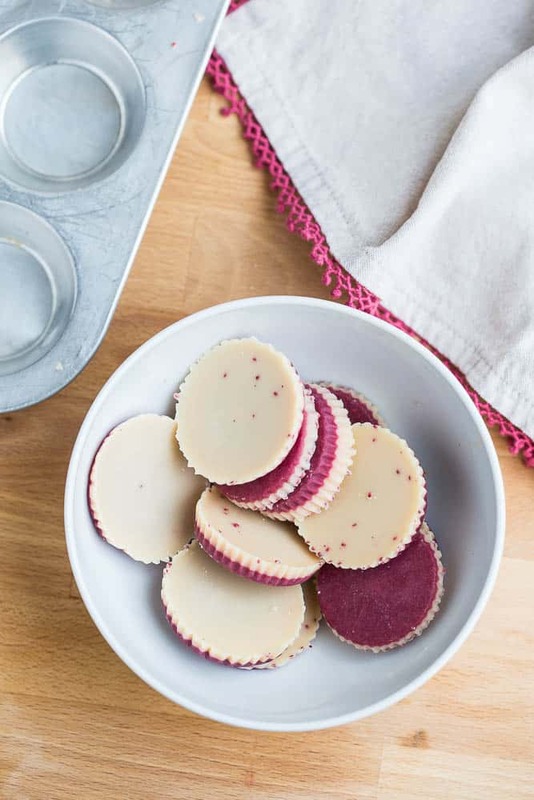 Hi there – I totally misread “freeze-dried raspberries” as “frozen raspberries.” The fat bombs are still delicious! However, the raspberry bits kind of crumble on the bottom and don’t become part of the solid mass above. Some remain in the paper liners. Still, the sweetest thing I’ve eaten in eight weeks. Will be interesting to see whether I trick my body with this or whether it reacts to this like it does to drinks with artificial sweeteners – kicks me out of ketosis. All worth it, even if it does. Rich and amazing to taste. Oh, I meant to ask: do you have any idea how many fat grams are in each of these? Thanks. Hi! Yeah, the raspberry does kind of separate. I wonder if it’s worse with the frozen ones? Good to know that the frozen raspberries work though! Thanks Cynthia! Also, net carbs is .8g each. So, less than a gram! Net carbs is .8 grams. what brand of dried raspberries are you using?? everything I find is full of sugar and is high is carbs? Are you checking the serving size for the freeze dried raspberries? Usually the entire bag is one serving, and you only need half of the bag for this recipe. I use the Simply Balanced brand at Target and the ones found at Trader Joe’s and they both have around 30g net carbs for the whole bag. There is only 1.2g net carbs in each fat bomb. I hope that helps! It’s so much cheaper to powder your own erythritol for using when making fat bombs. I buy Anthony’s brand from Amazon. I was the same way about fat bombs. I hit a plateau and thought I would give them a try. Even over eating them (I blame the stressful job) I lost 10# in 2 weeks! I’m now sold on the fat bombs, and my kiddos love them too. I can’t wait to give your recipe a go. It looks amazing! That’s good to hear! I’ve bought Anthony’s granulated before, and it has such a strong cooling flavor that I only use it in certain things that can mask that taste (like mint or dark chocolate things). I like the Swerve powdered sugar better — that weird cooling taste is practically non-existant. 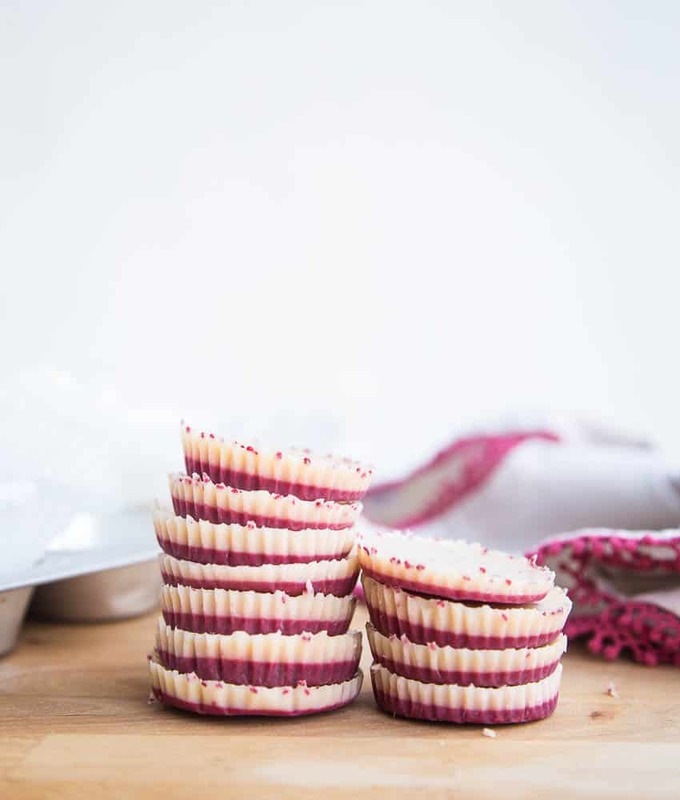 Helpful Hint ~ If you want the fancy layered look, don’t chill them in the freezer – the raspberries don’t separate. 8o( They taste AhhhMazing though! Thank you for the recipe! 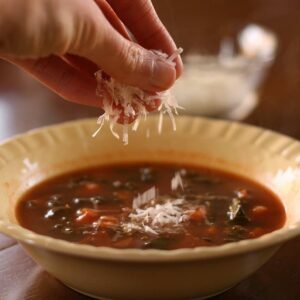 I love Carolyn’s books and especially this recipe! I’ve made them with freeze dried strawberries, blueberries, mango, and of course raspberries, but the strawberry are a hands down favorite at our house. Perfect bite for a sweet snack! I have just made these… they are in the refrigerator as we speak. Followed the recipe, no substitutions. By the time my sugar dissolved, the berries became a gooey mash on the bottom of the pan. When I took it off the stove, they hardened like candy. So they are a big glob on the bottom of each. Any ideas what I did wrong? Fat bombs are key for me! Thanks! Gooey? Did you use fresh raspberries or freeze-dried? I did notice that they settle a bit, so you have to keep it mixed well when you’re pouring them into molds. Is it okay to make these using a granulated sugar substitute as opposed to confectioners? Granulated sugar won’t dissolve as completely as confectioners, so they might be gritty. Used the exact same ingredients, same quantities, yet this recipe gives me 4g of net carbs per fat bombs. A single teaspoon of swerve has 3 grams of carbs, and this recipe calls for 1/4 of a cup. How could it possibly have under 1g net carbs with freeze dried raspberries on top off that?? If you check the back of the Swerve package you’ll see that the 3 “carbs” are from Erythritol. Sugar alcohols don’t affect blood sugar, so the carbs they contain are considered non-impact. Swerve is 0 net carbs! Great news! You have mentioned how many carbs, but I don’t see anywhere how many grams of fat? Oops! When I switched my recipe card formatting some of the notes got lost. I added it to the recipe notes, so you can find it there. 16 grams of fat per serving.